2012 was one of the wettest years on record in Ireland, and particularly so in the west, so this February it seemed like a good idea to head to Connemara and see for ourselves. Not as daft as it sounds, as February can be a cold, dry and sunny month, great for long views and memorable mountain days. However, our trip was presaged by the prospect of heavy rain showers and cloudy, windy weather. Our base for the four days was Clifden, a lively little town on the southwest of the range, but at this time of year,half closed for the winter and very quiet. From here we could access the Twelve Bens, Maumturks, Connemara National Park and Kylemore Abbey, (who do a fine line in tea and sticky cakes). 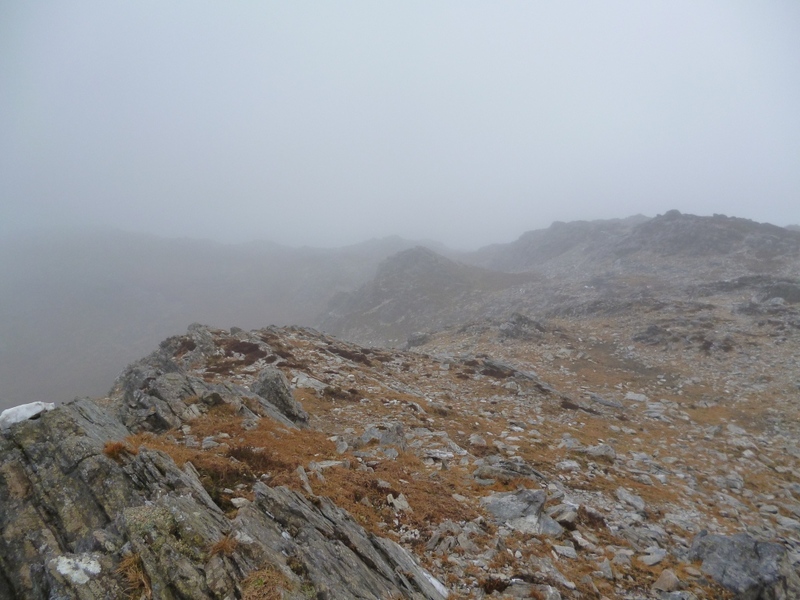 The first day was windy with patchy blue sky, hill fog shrouding the tops of the higher summits.we decided on the Bengower horseshoe,a route that took in Benglenisky, Bengower, (664m), and Benlettery. The hills of Connermara are mostly comprised of quartzite, a hard pale rock, which is essentially metamorphosed silica rich sand, (baked under high pressure).There are outcrops of granite too, but the quartzites define these hills, and give them their silvery grey appearance when wet, (which they often are), and their glaciated, ice scoured, steep sided form. The lower slopes are boggy and infertile, sphagnum mosses, lichens,and molina grass dominate, giving poor grazing for the sparse sheep that dot the slopes. Higher up you will find crowberry, heather, cowberry, clubmosses and lots of bare rock, ice smoothed and rounded outcrops dominate the higher slopes. Hard angular blocks and weathered gravel litter the ridges and summits, ready to trip any unwary foot, but make for great walking after the steep slog up from the sodden lower ground. Day two dawned windy and wet, with a dark, glowering sky and a cloud base around 150 metres. Clearly not the best of hill days, but undaunted we set of for the National Park visitor centre and a hike up the 440 metre Diamond Hill, (aka Bengooria), so named as it glistens in the sunlight when the rock is wet. Like so much else here in winter, the centre was almost completely closed, with only the toilets remaining open, the cafe being closed for refurbishment. Diamond Hill has a rounded top, rather like an upturned bowl, with an elongated summit ridge. The route is popular, and largely on boardwalks,paths and stone steps, an easy route to follow on a cheerless, wet and cloudy day. 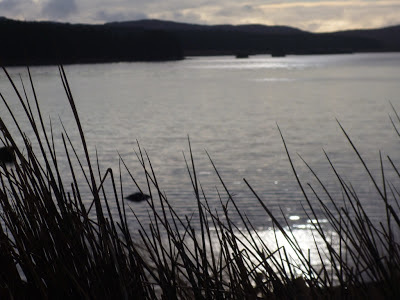 So leaving my map and compass in the rucksack we took to the trail and were back at the centre by early afternoon, chilled and damp we fortified ourselves with a flask of tea and returned to the car to spend the afternoon touring the coast roads. Another windy and showery day followed, and so we decided on a forest walk in the Derryclare Nature Reserve, in the south of the range. This is a strip of mixed deciduous and coniferous woodland, dominated by birch and willow, pine and spruce, and sits between Derryclare mountain and the lough of the same name. There have been reported sightings of red squirrel here, but suffice to say we never caught a glimpse of any squirrel, red or grey, we we did come across lots of frogs and associated frog spawn, croaking amorously in the flooded puddles and drainage channels alongside the forest tracks. It stayed dry long enough for a quiet lunch by the lough, but we soon chilled, and hastened back on our return route. On our final day we headed to Kylemore Abbey at the northern end of the Twelve Bens, here there was ample parking, and the prospect of tea and muffins after our hike. 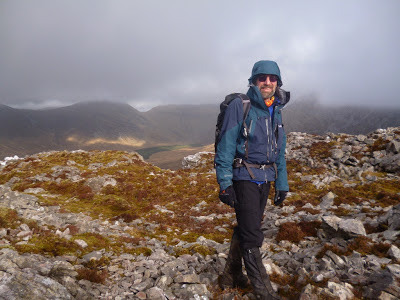 Our route was a horseshoe taking in the summits of Benbaun, Benbrack, (582 metres), and Knockbrack. The grassy flank of Benbaun, (this is a smaller hill than the Benbaun in the centre of the range and its highest at 729 metres), rises steeply after passing a megalithic tomb and a holy well in the Mweelin valley. We tasted the water for good luck, soft and cold, before beginning the slippery and unpleasant ascent on the steep and damp grass of Benbaun. 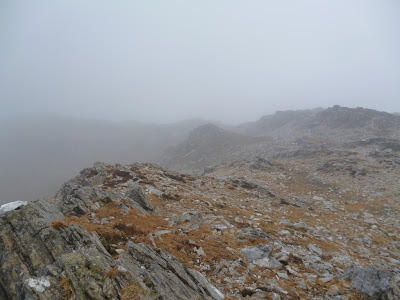 As we approached the summit and began to anticipate the respite from the hard ascent, the cloud came in and a soft drizzly rain started. There are meant to be fine views from here,but we were completely in cloud for the rocky ridge traverse up to the summit of Benbrack, an eiry, silent world, muffled by the hill fog around us.The cloud stayed with us as we decended the broad west ridge toward Knockbrack, eventually clearing as we approached the last hill, only to return again as the rain set in more heavily. By this time we were decending into the valley and a determined final push saw us at the tea shop half hour before closing, good timing! So was the trip worth it? 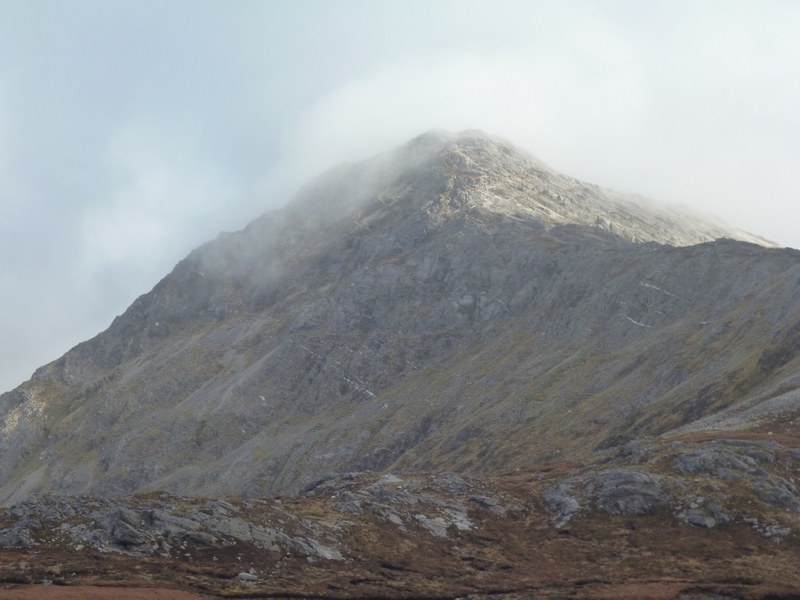 Absolutely, the ridges connecting the summits of the Twelve Bens make for superb hiking, and with the longer daylight hours that come with summer, bigger days can be planned and more stunning walks contemplated. And there are still the Maumturks, which we never got a chance to look at. We will definately be back to explore the area more fully in the near future.